Of the two weeks we planned for New Zealand, the first half was on the North Island. I don’t have a ton of photos to share. We slowed our pace down a little when we reached New Zealand. Maybe that’s appropriate, given the culture. But frankly I was starting to get burned out on the nonstop tourist routine. I wanted some down time to actually do some reading and writing, things that feel more like vacation to me personally. So I’ll just mention a few things we did on the North Island. 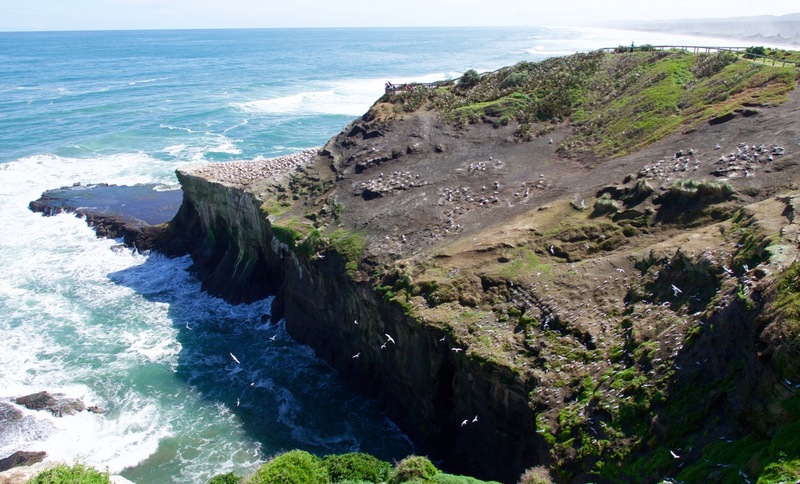 We started in Auckland, and one of the most memorable day trips we took was to the gannet colony on the east coast. Our tour guides were a local couple named David and Sue that we’d never met before. Here’s an example of the internet opening doors. I had only contacted this guy because, like me, he’s an old school fan of the science fiction role playing game Traveller. I had hoped to be able to drop in on a live-and-in-person Traveller game, something I haven’t done in decades, but the timing didn’t work out. Instead, he and his wife picked us up at our Airbnb lodging and drove us to the coast and a few other places on the way. Gannets, for those who don’t know, are very large sea birds. They’re not as big (or elusive) as albatrosses, but you don’t see them everywhere like you do with gulls. Anyhow, they apparently love this particular spot, because there were thousands of them here. Two weeks earlier, I’d attended a Chicks in Bowls gathering in Sydney. That one wasn’t very well attended, but this one was. 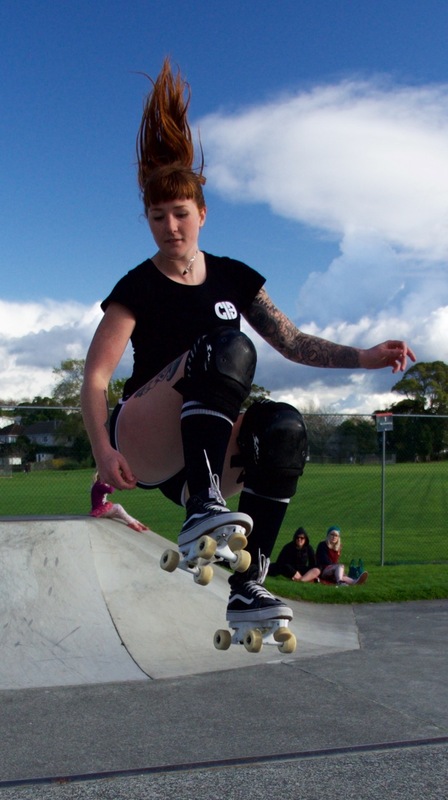 We first went to an indoor skate park because of rain that day. But that place closed early (and the carpool I was in arrived late). Beth said there are really only two things in New Zealand we absolutely must do. 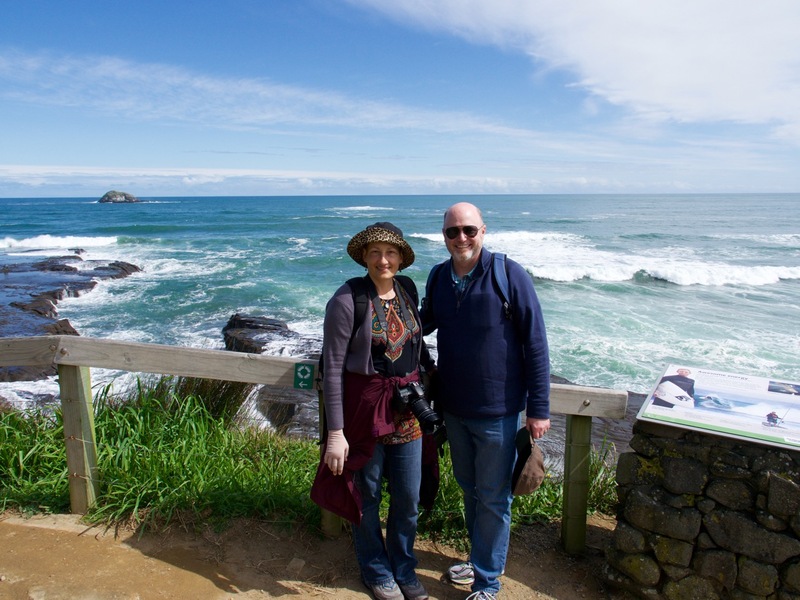 One was to visit the Hobbiton film set, and the other was to see an albatross. From our Airbnb in Hamilton, we drove our rental car out to the farms southeast of the city. There is the set used for Hobbiton in the Lord of the Rings films and the Hobbit films. They originally built the set for the LOTR films here, but then tore the sets down to return the land back to the sheep farmer who owns it. But then when Peter Jackson agreed to do the Hobbit films, they went back with a plan, and that was to build a more permanent set. This time, the set would remain after filming was finished, and it could become a tourist attraction to make extra money. Does giving tours to a steady stream of international tourists pay better than raising sheep? I have no idea, but it seemed like they’re doing a good business, and they extracted around 200 NZD from us that day. We took another day trip from Hamilton to visit the town of Raglan, on the east coast. The main point of interest was the Xtreme Zero Waste Facility, which is a recycling center with amazing breadth. I’m sure Beth is going to write extensively about this place, since going there was one of the main things she wanted to do in New Zealand. All I did was tag along and drive part of the way. I did see these birds on the side of the road, though. Last but not least, we stayed three nights in Wellington. I spent a lot of time at their national museum, called Te Papa. We also went to the botanic gardens there. But I didn’t get any photos. We stayed in an Airbnb right in the center of the good food zone. Within about 50 meters of our front door was a coffee shop, a Neopolitan style pizza joint (where Italian is spoken), a chocolate factory, a dive bar, and a bakery. Then we took a ferry to the South Island. But that’s another story. I wanted to say Hi. The pictures you are taking are amazing !!! Thanks, dude. Hope you’re doing well.